These perfect bite sized low carb gummies are the sweet treats you need a little more of! Super easy to throw together, you can make keto gummy bears or whatever you fancy with this recipe! In a small saucepan over medium heat, combine coconut milk, strawberries, lemon juice and erythritol. Stir to combine until erythritol has dissolved and strawberries are softened, about 8 minutes. Remove from heat and stir in the gelatin and vanilla (this is also when you’ll add the coloring if you’re using it). Use an immersion blender** to combine the ingredients and remove any lumps from the strawberries or gelatin — your ingredients should be as smooth as possible. Place your molds in the freezer for 12-15 minutes, or until the gummies have hardened, and enjoy! The serving size will vary depending on the size of your molds. I use this mold (which is a 1.1 x 1 x .09” heart) and was able to make 110 gummies. Which would make 1 serving size = to 5 gummies. 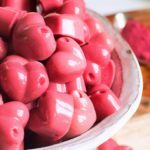 * I use 2 teaspoons of beet powder for more natural coloring, but it adds carbs to these gummies. Beet powder is not included in the nutritional information below. **If you don’t have an immersion blender, you can make this in a regular blender — just be sure your blender container is heat safe as the ingredients will be hot! ***If you don’t have enough molds to pour all the gummies at once, you’ll want to gently reheat the gummies before pouring the next set into the molds — I do this by keeping the stove on its lowest temp and refilling the molds as quickly as possible.